Once, they were bomb shelters, fortified underground structures that housed military operations or nuclear warheads. Today, they’re apartment buildings, tea houses, hotels and art galleries. These 15 converted bunkers capitalize on the strength and brutalist concrete architecture of the original structures and contrast it with modern materials like steel and glass. 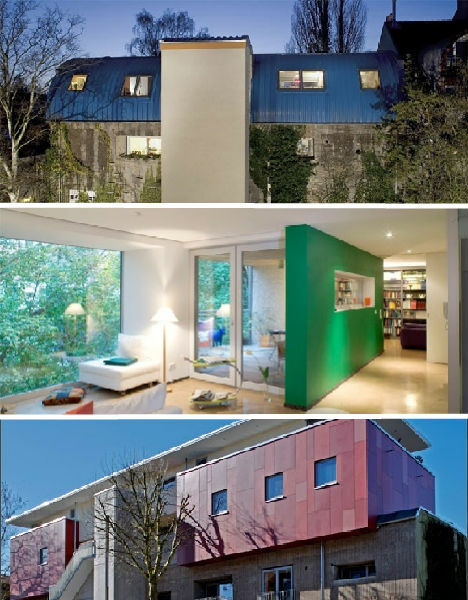 Bremen-based architect Rainer Mielke has made a name for himself transforming Germany’s many disused bunkers into beautiful modern homes and apartment buildings. Because German laws prohibit internal renovation of bunkers in case they need to be used in an emergency, Mielke used the massive buildings as foundations for new construction. “The old should remain old, and the new should use color to accentuate the old,” Mielke told The Local. 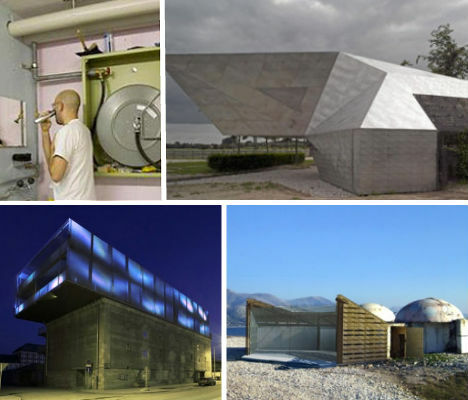 The three projects pictured above are just a few of Mielke’s completed projects, and he plans to create many more in the coming decade. Atop what was once a small, squat, nondescript concrete building has bloomed a stainless steel tea house by UNStudio. 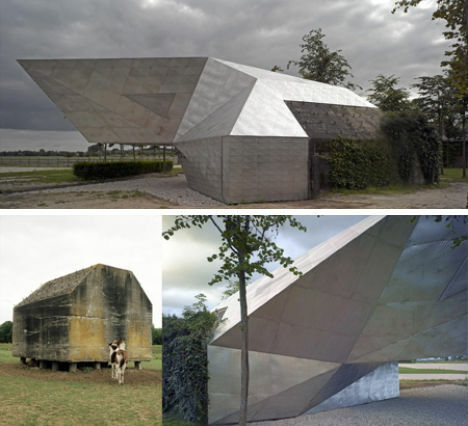 The project, in Vreeland, renovated the existing 1936 bunker and left it partially visible under the shiny geometric addition. The new part of the structure is only lightly connected to the bunker, so that it can someday be removed without damaging or changing the historic structure. 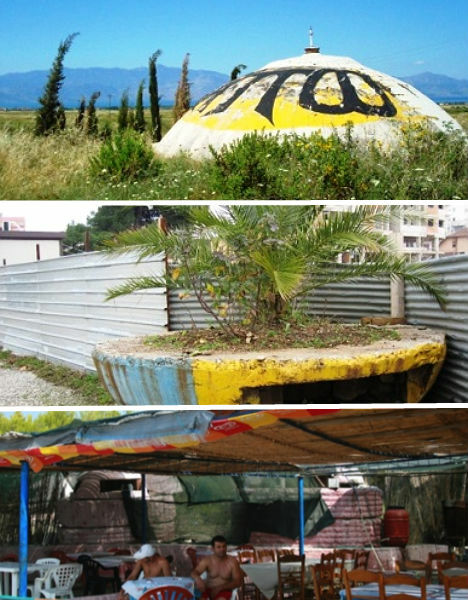 The landscape of Albania is dotted with 750,000 concrete ‘mushrooms’, bunkers that were created between 1945 and 1985 by a leader who influenced a culture of fear and paranoia, preparing the nation for an invasion of the USA or USSR that was never to come. The pre-fabricated bunkers, of questionable protective ability, are heavy and difficult to remove. Many of them are instead being transformed for new and modern uses – like this hotel. 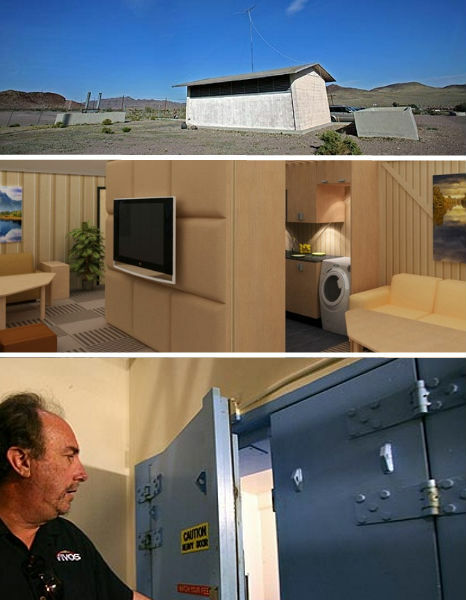 One of the most jaw-dropping bunker conversions is an underground lair fit for a James Bond villain, and – appropriately enough – houses two WikiLeaks servers. 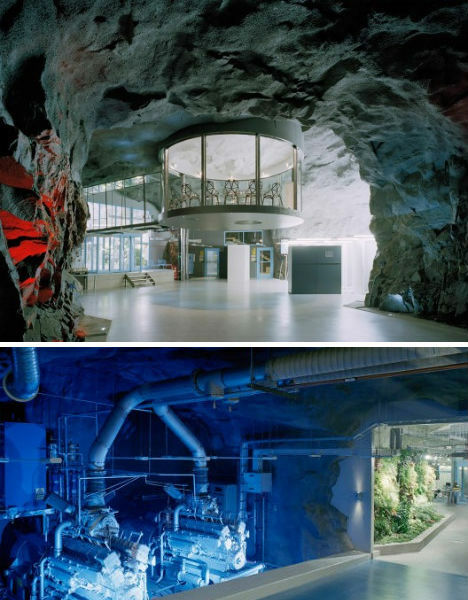 Located nearly 100 feet below the granite boulders of Stockholm’s Vita Berg Park, ‘Pionen White Mountain’ was originally created as a World War II bomb shelter and was transformed into state-of-the-arts data center in 2008. 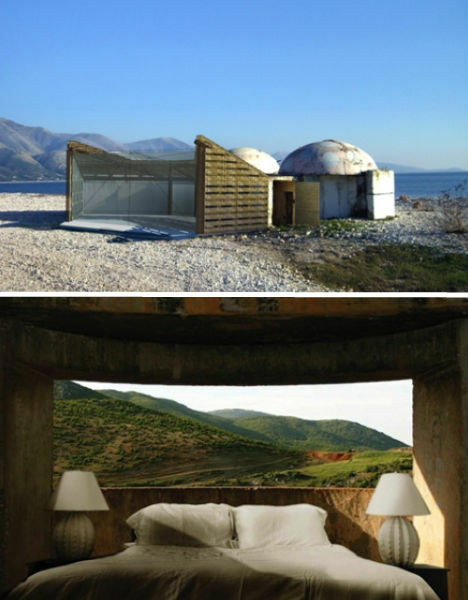 Hotels are far from the only new purpose that Albania’s concrete ‘mushroom’ bunkers are seeing as part of a nationwide makeover project. Pictured above are three such uses: a tattoo parlor, a planter and a cafe. There’s no heating, no windows and no hot showers, and you’ll have to share a room – army style – with other guests. But the price is right at the world’s first ‘zero-star’ hotel, the Null Stern, which occupies a disused nuclear bunker. You’ll pay $14 a night for a bed in a shared dorm room or $39 for a private room. 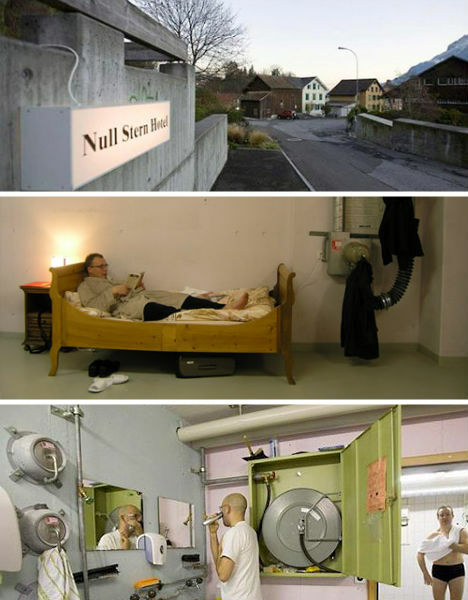 But the Null Stern isn’t actually open to just anyone – it’s an art project by brothers Patrik and Frank Riklin. 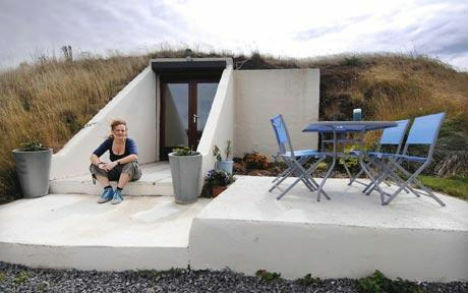 Originally built as part of Britain’s defense against Nazi Germany and later used for potato storage, one little bunker in Cornwall, England has now been transformed into a secluded vacation home offering 360-degree views from its grassy roof. Camouflaged and cut off from the world, the bunker was turned into a four-bedroom bungalow that, the owner notes, would be an ideal place to escape a zombie invasion. If you’re biting your nails over your current non-apocalypse-proof living situation, fear not – you can reserve a spot in a doomsday condo that the owners claim will keep 135 people alive for a year no matter what happens outside. This ‘luxury’ condo in Barstow, California is in a bunker built in the 1960s by AT&T to house their communications equipment. Nondescript from above, its depths contain a veritable underground town complete with entertainment and medical services. 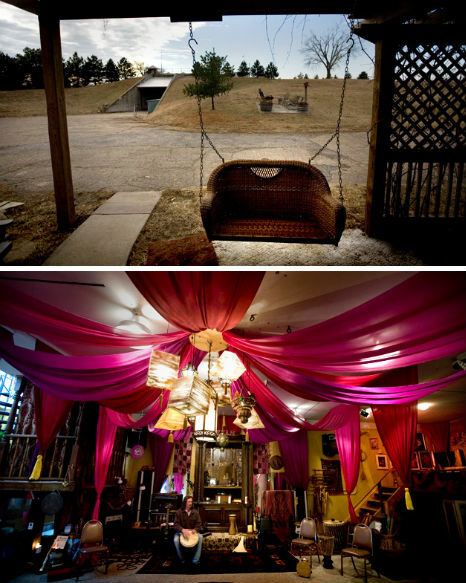 Many of the spots have already been sold, but developer Vivos plans to build similar structures near big cities all over the U.S.
Former schoolteacher Ed Peden turned a decommissioned nuclear missile bunker near his hometown of Topeka, Kansas into a hippiefied underground mansion, and loved the results so much that he’s now one of the Midwest’s leading missile base brokers. Peden and his wife inhabit just 6,500 square feet of the bunker’s 18,000 square feet of space. 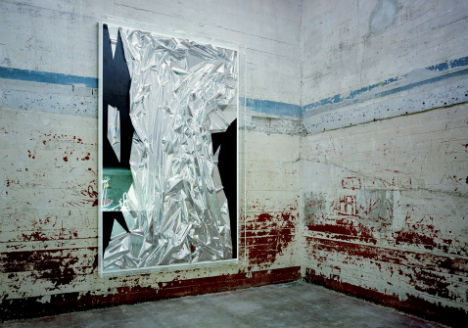 The peeling urban decay of old bunkers make a surprisingly pleasant contrast to modern art, as proven when collectors Christian Boros and his wife Karen Lohmann decided to exhibit their collection to the public in a converted bunker in Berlin. The bunker now acts as a permanent home for the Boros Collection, which includes works by artists such as Damien Hirst and Olafur Eliasson. Built in 1942, the bunker was renovated to enlarge many of the rooms and now includes a penthouse with terraces and a roof garden. Here’s another case of new construction sitting on top of a mostly-untouched historical structure. 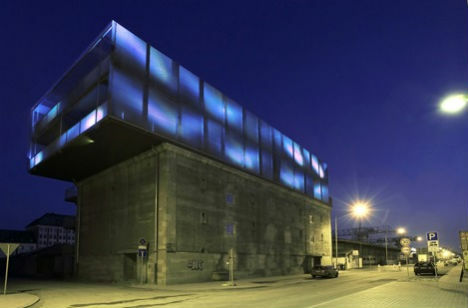 Index Archtekten turned a Frankfurt World War II bunker in a less-than-great area of town into musician’s studios, and created a new building on its roof that contains artist’s studios and the Institute of New Media. At night, the diaphanous wooden addition with its screen facade has a light and airy appearance in contrast to its heavy concrete base.